As we mentioned on our home page, Aikido is a non-competitive martial art involving a wide range of techniques that can be used to throw or immobilise an opponent. It helps to develop a greater understanding of harmony, balance & the dynamics of movement. We teach traditional Aikido as taught to Saito Sensei by O'Sensei, Morihei Ueshiba - the founder of aikido. During his 23 year apprenticeship at Iwama, Saito Sensei learnt about the relationship between weapons & body movement. Under the supervision of O'Sensei, Saito Sensei began organising the teachings of Aikido into a more structured format. This became known as Iwama Aikido. Aikido as the founder taught in Iwama. In addition to the empty hand techniques found in other styles of aikido, Iwama Aikido places equal emphasis on the use of aiki weapons - aiki bokken (wooden sword) & aiki jo (wooden staff) - which are used to develop body movement, strong posture & a better understanding of timing & positioning. For more about Iwama Aikido visit Takemusu Iwama Aikido Europe. Is this the only style of Aikido? No, there are lots of different styles. They each emphasise different aspects of the art and can look quite different to the casual observer. Can I train in different styles? 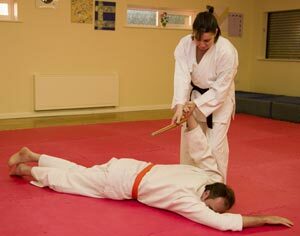 Most clubs welcome students from different styles of Aikido (although you should always check before hand). Regardless of your chosen style you should always respect the instructor and try your best to perform the techniques the way they are being demonstrated, rather than how you would normally perform them in your own dojo. A word of warning though: until you have a good grounding in your particular style, visiting clubs outside of your style may have the effect of confusing you a little and may slow down your progress rather than speed it up.